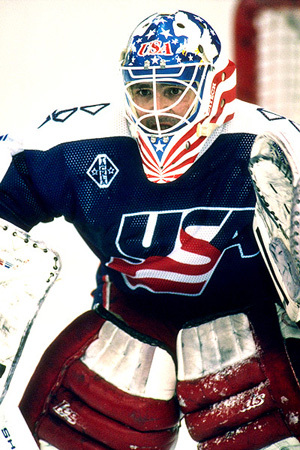 With the Olympics coming up and each of the U.S. goalies debuting their masks, I figured it would be fun to look at the various masks throughout the history of the Olympics and other national team events. The mask allows goalies to show their individuality and when it comes to national teams, that individuality usually manifests itself in some incredibly patriotic designs. 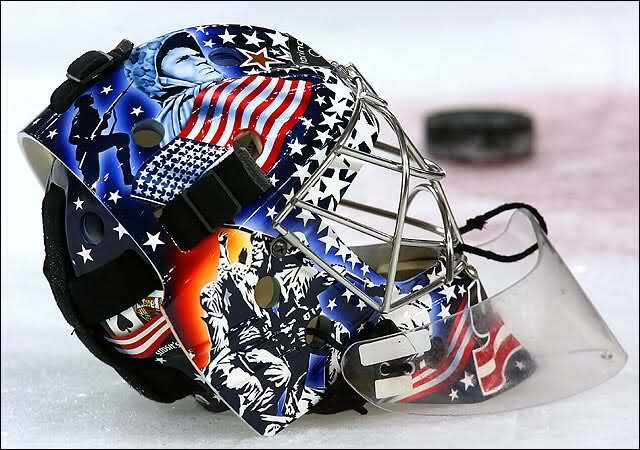 There have been many great masks in tribute to our troops, others that pay homage to some of our great monuments and symbols and even a few that incorporate U.S. hockey history into them. 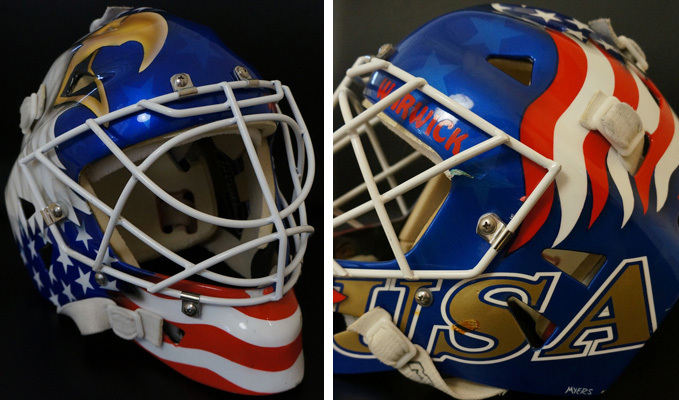 No matter the design, USA goalie masks almost always deliver. So with that in mind, I’ve compiled a bunch of different goalie masks from over the years. Part of it is to show the evolution of the Team USA goalie masks and the other is just to show off some cool designs that you might not have seen before. The goalie mask is hockey’s best piece of equipment and when it’s covered in red, white and blue, it’s even better. So without further ado, here’s a ton of goalie mask photos. And just as a note, the United States of Hockey Stylebook calls for Bald Eagle to always be capitalized, naturally. Most of the masks I’ve included come from over the last decade, so before we get to those, I wanted to start with something to give us some historical preference. Here’s what Jack McCartan wore while backstopping the U.S. to its first gold medal in the Olympics in 1960: His face. 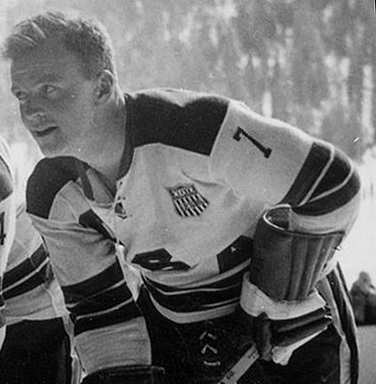 McCartan put together one of the best goaltending performances in history in 1960, helping the Americans beat Sweden, Canada, the USSR and Czechoslovakia in consecutive games to earn the gold medal in Squaw Valley. And he did it all without wearing a mask. 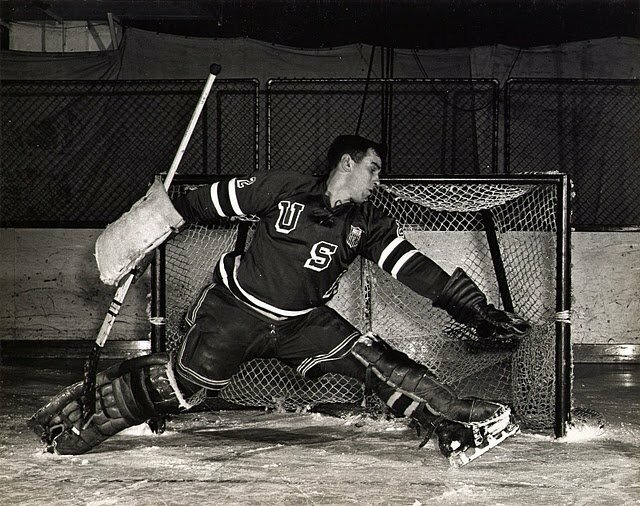 The U.S. won an unexpected silver medal in Sapporo Japan thanks to the spectacular goaltending of Lefty Curran. His mask looks more like something WWE’s Mankind would wear, but it got the job done on Team USA’s overachieving team in 1972. Jim Craig is famous for the Miracle on Ice and deservedly gets a ton of credit for essentially leading that team to the gold medal by making save after save. Without him, there may have been no Miracle. It’s still kind of amazing to see that mask technology was at this point in the 1980s. 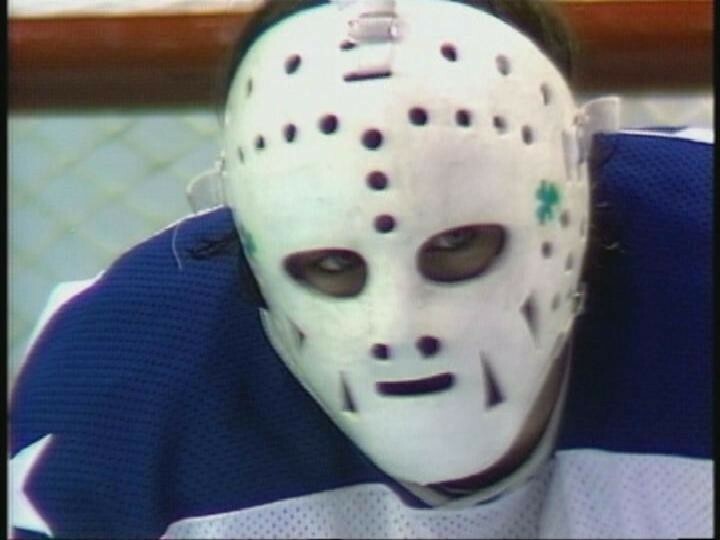 The only distinguishing thing about Craig’s mask was the two shamrocks near his eye holes. Maybe they brought some luck. Ray LeBlanc is one of the least famous U.S. Olympic goalies, but his effort in 1992 was Herculean. The team didn’t win a medal in 1992, but LeBlanc was lights-out for much of the tournament with a save percentage of .943. He did it while sporting this little number on his head. A few weeks after the Olympics, LeBlanc was recalled to the Chicago Blackhawks. He played in one game and made 21 saves in a 5-1 victory. It was the only NHL game he ever played. It got him on a hockey card at least, still sporting that USA mask. He did have a long minor-league career and now lives in Florida. Current New York Islanders general manager Garth Snow was the starting goaltender for the U.S. Men’s Olympic Hockey Team in 1994. LeBlanc proved too tough an act to follow and the U.S. club struggled at the 1994 games in Lillehammer. Snow did have a pretty nice mask, which like LeBlanc’s was made by ITECH. 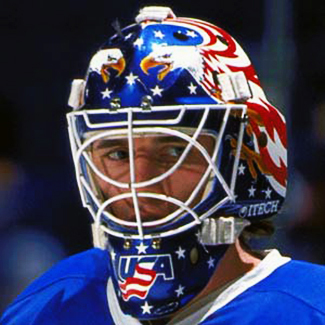 Snow also got the post-Olympics call to the NHL and ended up sporting this amazing Bald Eagle Flag kind of design while playing for the Quebec Nordiques, which oddly enough worked OK.
Tim Thomas played on the 1999 U.S. Men’s National Team at the IIHF World Championship. This was his mask, which certainly allowed Thomas’ inner patriot a good chance to burst out. Mike Richter had a lot of success in a U.S. jersey with a 1996 World Cup of Hockey MVP performance and another solid effort as Team USA took the silver medal at the 2002 Olympic Winter Games in Salt Lake City. 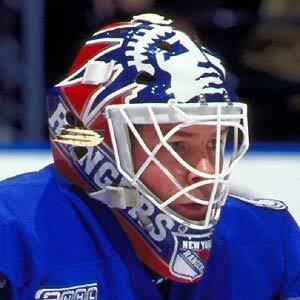 The nice thing for Richter is that playing for the Rangers basically allowed him to never have to alter his mask. It was pretty darn solid as it was anyway, so why mess with a good American thing? Rick DiPietro’s masks almost always skewed towards honoring the military and his mask for the 2006 Olympics was no exception. He had some really nice art work on here and swapped out his Islanders logo on the chin for the USA’s waving S shield. You can say what you want about DiPietro’s career, but he always had good taste in headgear. In 2010, Ryan Miller brought out an incredible design. He also brought his best game to Vancouver as Miller was named tournament MVP and had a historic performance en route to the silver medal. 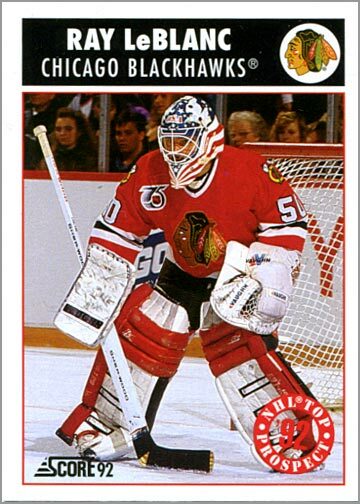 Bishop Designs out of Michigan had to make some alterations to his back plate thanks to some IOC complaints, but the main design was left unchanged and was one of the all-time great USA masks. Jack Campbell went to the World Junior Championships on three occasions and each time had a different mask. Of the three, his Captain America lid from 2012 was easily the most memorable. Designed by David Gunnarson, who has done some of the best masks in the game, Campbell wore this during the 2012 World Juniors. Unfortunately, it was a pretty rough go that year as the U.S. finished a shocking seventh. After losses in the preliminary round to Canada and the Czech Republic, Campbell went back to the mask he wore in 2011, but at least this one was nice to look at. The worst part about Team USA’s run to the gold medal at the 2013 World Junior Championship is that we never got to see this beautiful mask in game action. Garret Sparks never dressed as the No. 3 goalie on the squad and neither of the other two goalies — John Gibson and Jon Gillies — got new helmets for the tournament. With a mean-looking Bald Eagle on both sides, Sparks was giving a slight nod to his favorite goalie growing up, Eddy Belfour. This mask, which was designed by Air Trix Studios, even with the Bald Eagle is a little outside the norm. There’s almost a little something mystical about this mask. Even though it never saw game action, it’s a really solid entry for something like this. Current Boston College goalie and the top rated goalie for the 2014 NHL Draft, Demko sported this little piece of Americana during his season with the U.S. National Under-18 Team at the National Team Development Program. He also used it at the 2014 World Juniors, where he was the third goaltender for Team USA. Todd Miska, whose son Hunter was also a goalie on the Under-18 Team, painted the mask. You’ve got your menacing Uncle Sam on one side and a tribute tot the troops on the other with a nice flag pattern throughout. In the red stripes on the flag, major battles in U.S. military history are listed. This has been one of my favorite masks of the last few years for sure. Photos via USA Hockey. You can see Hunter Miska’s mask and a photo of Demko’s backplate, which honors the late Ian Jenkins and includes nods to Olympic gold medalists Jim Craig and Jack McCartan, here. Thanks to Ashley Chase of WJAC-TV in Johnstown, Pa., we got to see one of the coolest masks in all of youth hockey. This belongs to Boston Bradley, a 15-year-old goalie for the Johnstown Warriors midget team. On one side, you have the great Jim Craig with a backdrop of an American flag, which is cool all by itself. On the other side there’s a picture of a trio of players from Boston University, Mike Eruzione, Craig and Jack O’Callahan hugging. Pretty awesome mask for a 15-year-old, or for anybody. His younger brother’s mask is pretty cool, too. Our second ode to Jim Craig comes from Wyatt Waselenchuk, who played for the U.S. national University Team at the Winter World University Games in Italy last December. A member of the Minot State hockey club in the ACHA, Waselenchuk’s mask designed by Diel Airbrush is another one of my all-time favorites. 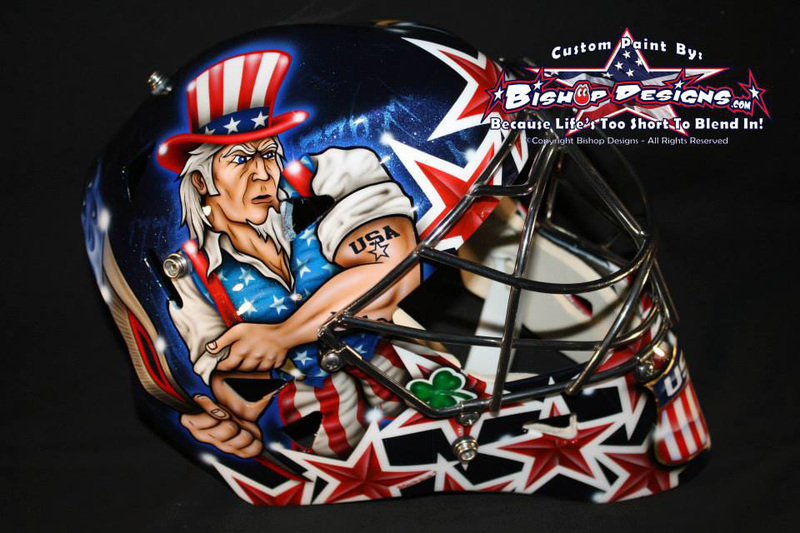 With the iconic pointing Uncle Sam on one side and an ode to a fellow U.S. goalie on the other, it’s quite a sight. There’s also Bald Eagle silhouettes all over and the waving S logo on the chin. The U.S. University Team actually did a lot better than expected this year as well, finishing in fourth place. 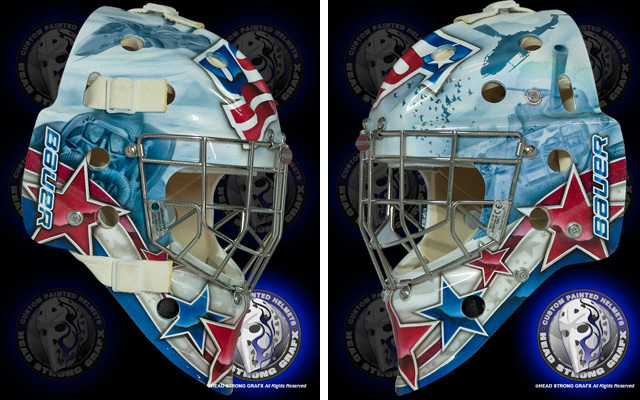 Team USA’s backup at the 2014 World Junior Championship, Stolarz went with the military theme for his mask, which was designed by Head Strong Grafx. We’ve seen tanks before, but the fighter jets are pretty under utilized and the whole icy blue hue to this mask makes it a really beautiful mask. Stolarz did make one appearance and shut out Germany, so this mask was put to good use in 2014. The starter for Team USA at the 2014 World Junior Championship, Gillies had some pretty excellent Bald Eagle usage here. Sometimes the crown of a mask can be underutilized, but it looks awesome here. Painted by Jesse’s Custom Design out of Boston, I think my favorite detail in the mask is the feathers along the jaw line making for a really cool looking American flag design. Gillies’s backplate, not pictured, is really cool as well with a Providence Friar silhouette and nods to past WJC gold medal winners Jack Campbell and John Gibson. During the 2013-14 Bring on the World Tour, Vetter rocked one excellent mask. With the Statue of Liberty and Mount Rushmore prominently featured and a nice flowing American flag, it looks like a patriot starter kit and it’s just awesome. The other side, not pictured, features a rather perturbed looking Bald Eagle. 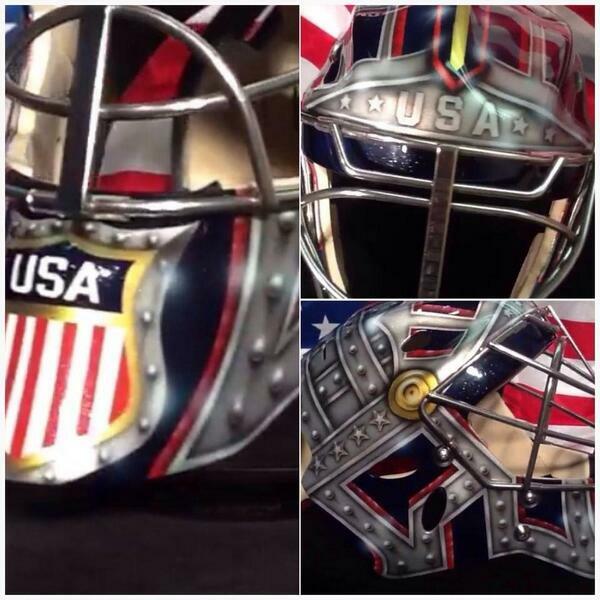 Though this is a really great mask, Vetter got a new lid for the Olympics, which comes up next. Photo via USA Today, Brace Hemmelgarn. Not all of the masks are out yet, but most are and pretty much all of them are great and unique in their own ways. The cool thing about the Olympics have three goalies per roster is that it means we get six new amazing masks to gawk at. 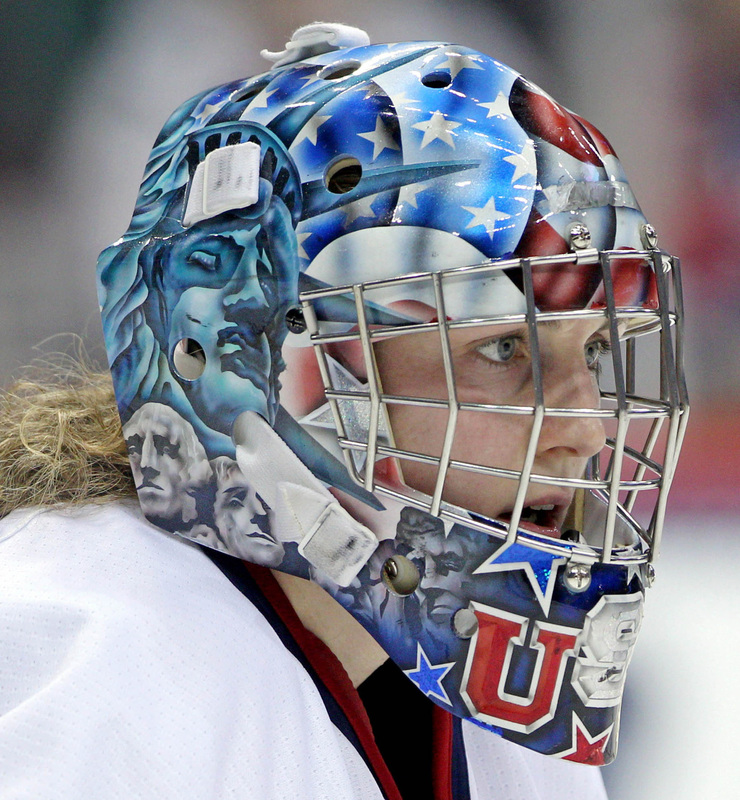 Vetter’s mask caused a little controversy when she was told she had to remove the image of the U.S. Constitution from the back of her mask, which prominently featured, “We The People.” It was viewed as government propaganda by the IOC, which is pretty much preposterous. Either way, even without the constitution gone, it’s still a pretty great mask. The USA shield includes actual 23 karat gold embossing, which is awesome. Molly Schaus is battling Vetter for the No. 1 job, but I’m giving her a slight edge in the mask department, mainly because I am a sucker for anything 1960 Olympic Team related. 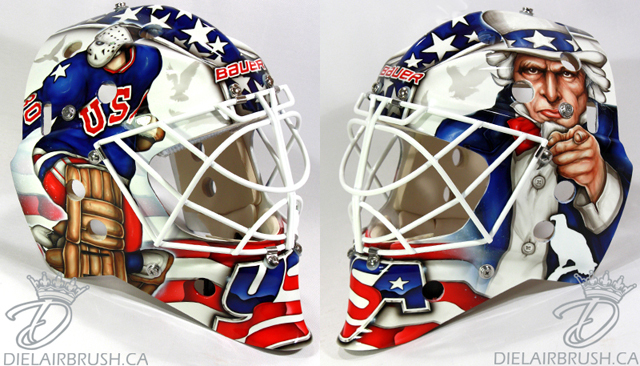 I also love this: Jesse’s Custom Designs, who painted this mask, incorporated the Team USA shield into the U.S. Coat of Arms, which is awfully clever. 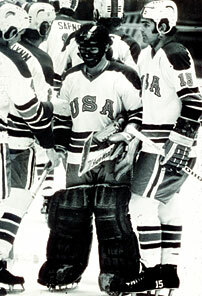 On the opposite side of the mask is the diagonal USA with a blue background as it appeared on Team USA’s 1960 jerseys. See McCartan photo above. So that puts this mask in very high regard for me. 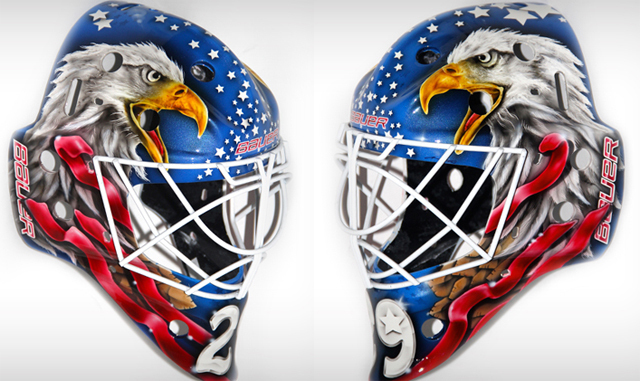 McLaughlin’s mask, which was designed by Bishop Designs, who also did Miller’s and Howard’s 2014 masks, also incorporates the new USA shield, but adds a Bald Eagle clutching it. The Bald Eagle also has a shamrock in its mouth, a nod to McLaughlin’s heritage. There’s also a flowing banner with “Land of the Free” on one side and “Home of the Brave” on the other. Her backplate also includes the Ohio state flag in an outline of the state. The names on the back (which I’m willing to bet the IOC will make her remove) has McLaughlin crossed out as she got married over the summer. Her married name is Bittle, so it’s a little bit of a joke. We already had a full post detailing the work on Miller’s mask, so check that out here. The updates done to his 2010 mask for 2014 really are quite great. I really like the stars and some of the added details in this one and the clever things Bishop did with the backplate. The official photos aren’t out yet, but EyeCandyAir offered a sneak peek, which was detailed in a post here. 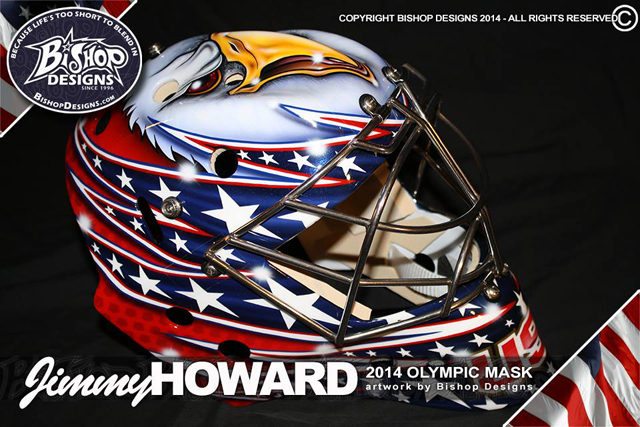 Another mask from Ray Bishop, Howard’s mask is extremely bold, colorful and of course, patriotic. The Bald Eagle on the crown looks a little on the angry side and has the red eyes to match. 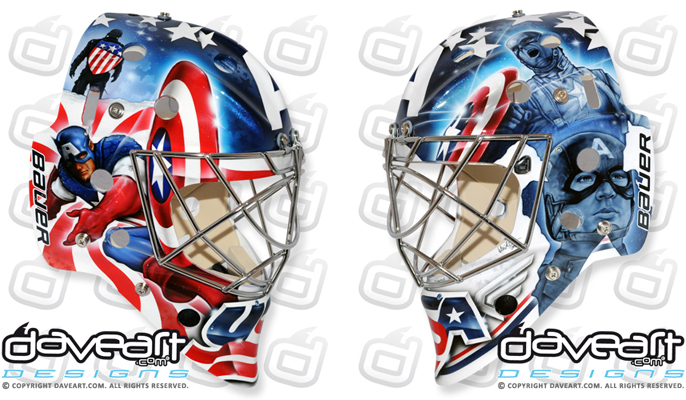 I really like the USA on the chin of the mask as it pops pretty nicely off the blue with white stars. It certainly stands out due to the bold colors and very few masks of the past have gone with as much red as this one does, which is kind of nice to see. As you can see, there’s been no shortage of amazing goalie masks over the years with a USA theme and we’ve got six great new additions with the 2014 Olympics coming up. This entry was posted in 2014 Olympics, NHL, NTDP, U.S. National Teams, USA Hockey. Bookmark the permalink.